Hex - Octal Converter is an online tool to perform conversion between octal & hex number systems in digital electronics & communications. The numbers & alphabets 0, 1, 2, 3, 4, 5, 6, 7, 8, 9, A, B, C, D, E & F are known as hexadecimal numbers and represented by base-16 notation. Whereas, the digits 0, 1, 2, 3, 4, 5, 6 & 7 are known as octal numbers generally represented by base-8 notation. The solved example problems & conversion table may useful to understand how to do such hex - octal conversions manually. By using this converter user may find the equivalent octal or hex numbers for the hex or octal input respectively by slecting the appropriate radio button & supplying the respective inputs. One of the easiest conversion in digital electronics & communications. Follow the below steps to perform hex to octal number conversion. step 1: Separate the digits of the given hex number, if it contains more than 1 digit. step 2: Find the equivalent binary number for each digit of octal number. Add 0's to the left if any of the binary equivalent is shorter than 4 bits. 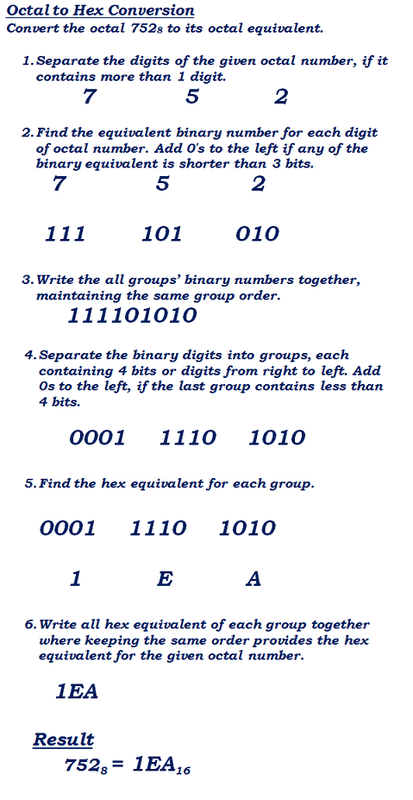 step 3: Write the all groups binary numbers together, maintaining the same group. step 4: Separate the binary digits into groups, each containing 3 bits or digits from right to left. Add 0s to the left, if the last group contains less than 3 bits. step 5: Find the octal equivalent for each group. step 6: Write all octal equivalent of each digit together where keeping the same order provides the octal equivalent for the given hexadecimal. The below solved example problem may useful to understand how to perform hex to octal number conversion. Convert the Hexadecimal (B 5 A)16 to its octal equivalent. Similarly, the octal to hex number conversion can be done by following the below steps. step 1: Separate the digits of the given octal number, if it contains more than 1 digit. step 2: Find the equivalent binary number for each digit of octal number. Add 0's to the left if any of the binary equivalent is shorter than 3 bits. step 3: Write the all groups binary numbers together, maintaining the same group order. step 4: Separate the binary digits into groups, each containing 4 bits or digits from right to left. Add 0s to the left, if the last group contains less than 4 bits. step 5: Find the hex equivalent for each group. step 6: Write all hex equivalent of each digit together where keeping the same order provides the hexadecimal equivalent for the given octal number. The below solved example problem may useful to understand how to perform octal to hex number conversion. Convert octal number (7 5 2)8 to its equivalent hexadecimal. The below is the conversion table for Decimal, Binary, Octal & Hex number systems. In digital electronics & communications, the conversion between different number systems play vital role to perform various operations. The above solved example & number conversion table may useful to understand how to perform hex - octal calculations, however, when it comes to online, this hex - octal converter may useful to perform such computations as easy & quick as possible.